APC’s Switched Rack Power Distribution Units (PDUs) are premium solutions to many of the power management problems seen in today’s IT environments. Some of the problems are unauthorized use of power outlets, locked-up equipment, in-rush current, overloaded circuits, and the need of remote access to power outlets in the rack. The Switched Rack PDUs address these problems through individual outlet control, power on and off delays, current monitoring, alarm thresholds, and network management. Individual outlet control allows users to turn outlets on, turn outlets off, or recycle power to equipment, which can reboot locked-up equipment and avoid unauthorized use of outlets. Power delays allow users to determine the order in which equipment is powered up or down. Utilizing the power delay feature will avoid in-rush current, which can cause overloads. Monitoring the current draw at the rack level is key to avoiding downtime due to overloaded circuits. 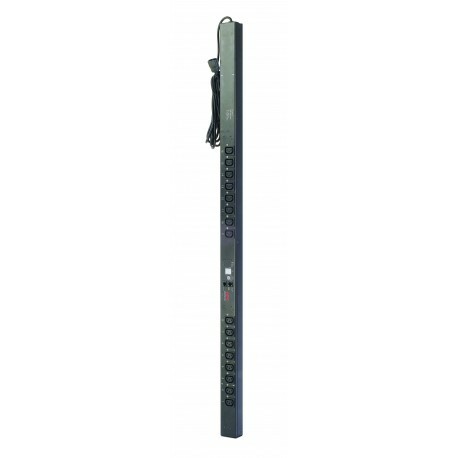 The Switched Rack PDUs provide an aggregate current draw, which can be viewed remotely or locally, via digital display. In addition, alarms will be generated based on user-defined thresholds to alert users of potential circuit overloads (NOTE: Currently available on select models only. Please see feature list for availablity per SKU). Users can access, configure, and control the Switched Rack PDUs through Web, SNMP, or Telnet Interfaces.